Today I needed to enlarge a virtual hard drive used by a Hyper-V virtual machine. No problem: I used the third-party VHD Resizer which successfully copied my existing VHD to a new and larger one. The snag: when I renamed the VHDs so that the new one took the place of the old, the VM would not start and Hyper-V reported “Access Denied”. I looked at the permissions for the old VHD and noticed that they include full access for an account identified only by a GUID. Even more annoying, you cannot easily add those permissions to another file, as the security GUI reports the account as not found. This replaced the correct GUID for the VM. Incidentally, this might not work if you use a remote Hyper-V manager. Permissions for remote management of Hyper-V are a notoriously prickly thing to set up. I have had problems on occasion with importing VMs, where this did not work from the remote management tool but did work if done on the machine itself, with similar access denied errors reported. If you use exactly the same account it should not be a problem, but if the remote user is different then bear this in mind. Kudos to Vadims Podans on the Network Steve Forum who has the answer. The Exchange 2010 wizard creates the request in a Unicode file. Certificate Services only understands Ansi. You have to open the request file in Notepad and then Save As specifying Ansi encoding. Then it works. Podans has that information too. I realise that the majority of Exchange admins submit certificate requests to commercial authorities rather than internal ones. Still, you would hope that a Microsoft certificate wizard would be compatible with Microsoft’s own certificate server, at least if you check the right box. 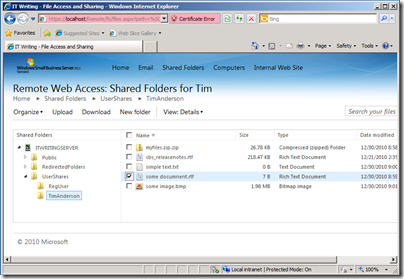 Among the most interesting features in the new Small Business Server 2011 standard edition – I suspect it is in the Essentials version as well – is the ability to access shared folders remotely via a web application. This is actually a feature borrowed from Windows Home Server, which also exposes shared folders in its remote access web application. Note this is different from SharePoint, which is also available in SBS. SharePoint stores files in a SQL Server content database and publishes them in document libraries. Shared Folders by contrast are simple file shares. Although they lack the rich features of SharePoint, such as discussions, or check in and check out, they are faster and more convenient when all you want to do is to share files. 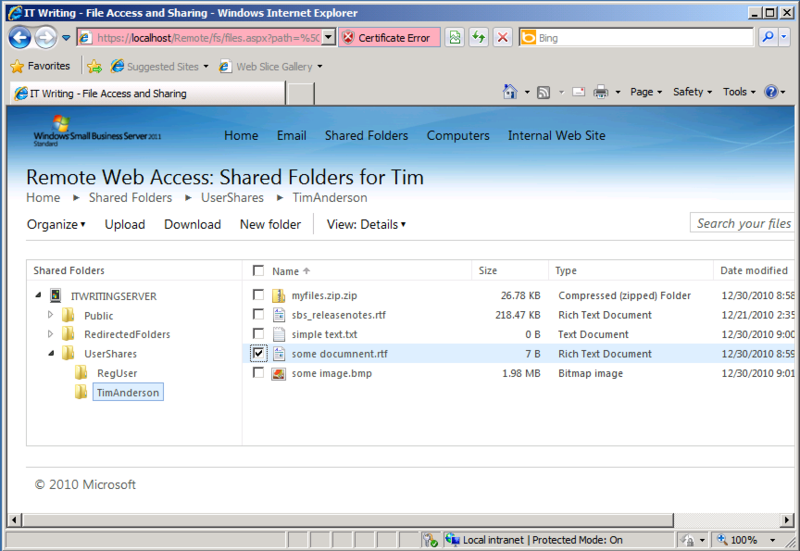 Another benefit is that on the local network you can access shared folders directly with Windows Explorer. This can also be done with SharePoint, but under the covers it uses WebDAV – web distributed authoring and versioning – which is slower and can be tricky to get working, especially on Windows XP. SharePoint is also less suitable for files of types that it does not recognise, whereas a shared folder will accept anything you care to put into it. While these may seem subtle distinctions, in practice they are not, and the matter of SharePoint versus shared folders is one that some businesses struggle with. Now that you can publish shared folders through the Remote Web Access web site, this issue will be less pressing, since remote access without the need for VPN (virtual private network) is often the key reason for moving files into SharePoint. The Remote Web Access site is not itself a SharePoint site; it is an ASP.NET application that you can find in C:\Program Files\Windows Small Business Server\Bin\WebApp\RemoteAccess. I noticed two ASP.NET user controls, one called filesgadget.ascx and one called richupload.ascx. If you browse to this site, you can access folders and files in the SBS Shares to which you have access, controlled by NTFS permissions. 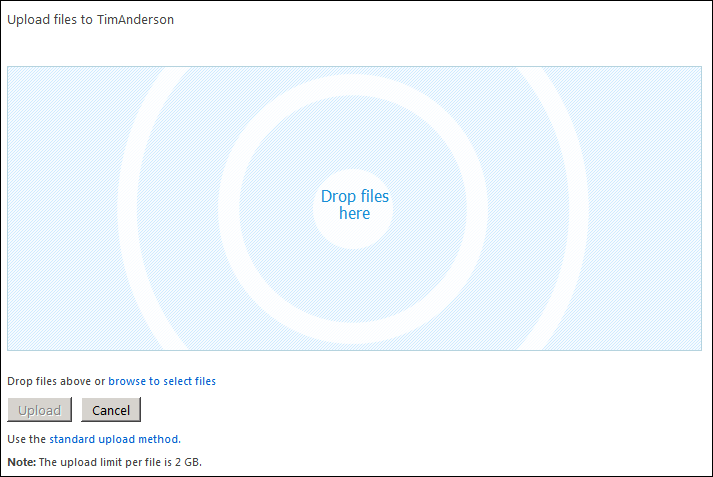 The file sharing application will pick up any shared folders on the server. When you open a folder, the files are listed in the browser with options to upload, download, delete, rename, copy, cut or paste. If you choose Upload, you can add documents by dragging them into the browser. I also tried the site in Google Chrome. It worked, though not the drag-and-drop file upload. 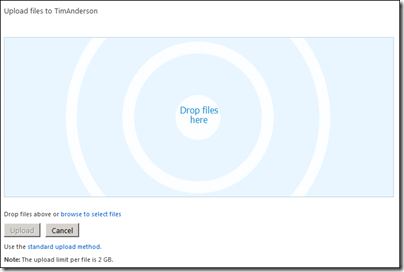 You can still upload files using a standard file chooser. This looks to me like a great and overdue feature for Small Business Server. The only snag I can foresee is that some users may still find the SharePoint vs Shared Folder choice confusing and wonder why documents in the “Internal web site” are presented differently and with more features than those in shared folders. It may still be difficult to decide which to use; but at least the choice will no longer be driven solely by whether remote access via the browser is required.